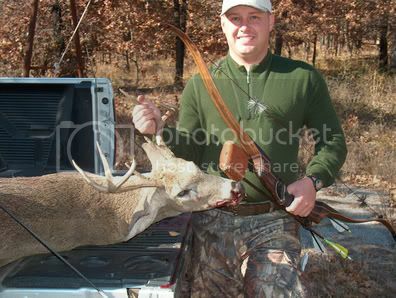 Shot this little buck on opening morning of gun season in Oklahoma while hunting on 130ish acres with 4 buddies shooting high powered rifles. He came in at 8am, stood broadside at 5 yards, and looked away as if on cue. Hit him perfect and he ran 40 yards and piled up within sight. He's not the biggest, but it was so much fun and such a rush to watch him go down! I'm amazed by the killing efficiency of a well-placed, razor sharp broadhead. Plus, it was fun to talk a little trash to my friends as they walked back into camp with their rifles in hand. Congrats on the buck. It's great to see em go down in sight!!! Any animal with a bow is a trophy.....way to show them up. I'm very happy for you.